The Designer's Downtown Market was great! I had a really fun time setting up and seeing all my dresses get a day in the sun. I'm so thankful to Paul and my mom for all their help too. Paul made some awesome racks for the dresses to hang on and helped with other handyman stuff, and my mom did some last minute sewing for me and also did a great job as a saleslady with me in the booth. We had several sales and got to talk to a lot of people about future custom orders. It was super! The Live Lovely Dress Shop will soon go live! I'm frantically getting ready for my first craft show. I'll have a booth at the Designers Downtown market this weekend and I'm having so much fun putting it all together. Once it's all over I'll post some pictures of everything. But I've already had one really nice fellow artist get in touch about ordering a dress after she saw me on the DDM website. Fun! I think it will be great to take all this sewing and posting and ordering to a more personal level. Wish me luck! 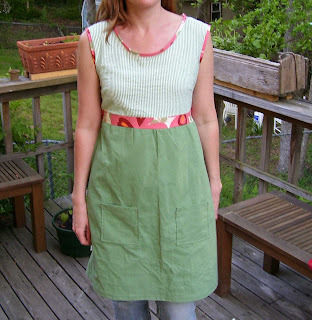 So I put off making that other garden dress until tomorrow and instead made one for me, because . . . it's my birthday! I made a new pattern which I almost goofed up. Who'd have thunk you needed so much allowance for pin tucks? But I got it fixed well enough and I think I know how to change the pattern for the shop now. This will be the weekend dress I believe. What do you think of it?